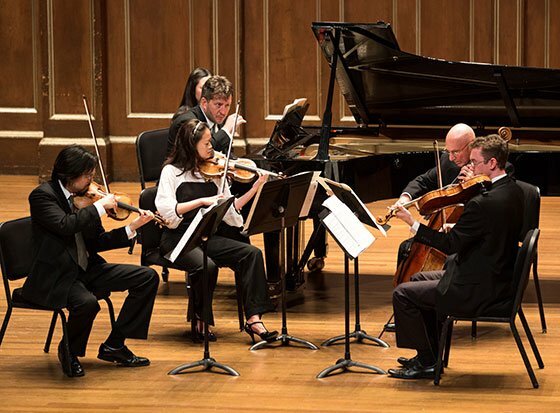 There was a whiff of France in the air at the Boston Symphony Chamber Players concert at Jordan Hall on October 13th, notwithstanding that the program, the first in BSO CP’s 50th season, featured two works by this weekend’s English BSO guest conductor, Thomas Adès. The rest of the program was unquestionably French, with works by Debussy and Ravel, but at least one of the Adès pieces was inspired by the French baroque master François Couperin. That was the work that began the concert, the Sonata da Caccia, op. 11, for oboe, French horn and harpsichord, performed by BSO principals John Ferrillo, oboe, and James Sommerville, horn, with the composer at the keyboard. An early work, dating from 1993 when Adès was 22 and just out of college, it utilizes thematic material, formal procedures, ornamentation and even movement titles (Gravement, Gayëment, Naïvement, Galament) that would not be out of place in the 18th century—and which Couperin actually used in various pieces. What Adès did to make these materials more his own was to mess with rhythm and harmony, putting instruments into Ivesian rhythmic counterpoint and clashing keys that threw the music, as Virgil Thomson used to say, in and out of focus. In addition to its reference to hunting, a traditional use of the horn, the work’s title (and we’re indebted to Robert Kirzinger’s excellent note for this insight) alludes to musical lines that chase after each other; the piece is replete with contrapuntal effects, both exact and rhythmically distorted. It also puts the test to the horn, with much passagework written in its upper registers, licks that Sommerville adroitly negotiated, while Ferrillo’s part called for and received a more placid elegance. Adès wrote for himself a toccata-like part that alternated rapid scalar passages with blocky chords and some surprisingly pianistic octaves. The difficulty with writing this kind of “wrong-note” music nowadays is the risk of sounding, on the one hand, too much like Stravinsky, and on the other hand, too much like PDQ Bach. This work managed somehow to survive with its dignity intact, but with a sense that, like a lot of early Britten, it might be too clever by half. Taken as a youthfully exuberant “look Ma no hands” workout, it and its performance were engaging and winsome. The closing work on the program’s first half was the ever-popular Debussy Sonata for Flute, Viola and Harp, which received a superb performance by Elizabeth Rowe, Cathy Basrak and Jessica Zhou, respectively, the latter making her first appearance since giving birth a few weeks ago. This late work (1915), one of three completed efforts in a projected cycle of six purely abstract chamber works, like its companion violin and cello sonatas, represents the compression of Debussy’s art into brilliant gems. One needn’t say more about the piece itself other than to marvel at how logical and persuasive Debussy could make a piece, seemingly by sheer willpower, that is so formally incoherent; even the supposed minuet middle movement defies its name and ostensible tempo in the fluidity of the composer’s mind. The performance was itself a gem, a liquid crystal of supple lines and gorgeous tone. Rowe especially brought to it the perfect balance between composer and expression, with her tight vibrato a major contributor. Basrak began a bit diffidently but found her voice by midway into the first movement, and thereafter held it with supple tone and gracious phrasing. Zhou’s account was full of delicacy, yet hers was the glue that held the disparate threads of the other instruments together. We would never go to another performance of this piece expecting to hear a better one. The second half began with Ravel’s Chansons madécasses, for voice, flute, cello and piano. Dating from 1926, it was not as relatively late a work as the Debussy, but written at about the same age; like the Debussy trio the expression in this piece was a pared-down essence of a composer noted for lush sounds. These three songs, often sung by a mezzo-soprano but here by baritone John Brancy, with Rowe, Jules Eskin on cello and Adès at piano, are settings of poems by 18th century aristocrat Evariste-Désiré de Forges, ostensibly, though doubtfully, translated from sources in Madagascar. The accompaniments are often spare, reflecting perhaps changes in Ravel’s esthetic outlook, perhaps just general post-war trends (like Stravinsky, Ravel hated to be thought old-fashioned). The middle song, Méfiez-vous des blancs (Beware the Whites), in a near-declamatory setting, caused a considerable stir in a still-colonialist France, while the two outer songs, Nahandove and Il est doux de se coucher (It is good to lie down) have a sensuality that, if anything, is enhanced by Ravel’s restrained settings. Brancy has a commanding voice and excellent intonation; its power was best deployed in the middle song. Singing without a score, he displayed good dramatic vocalization but hardly any follow-up with the rest of his body; we also found his French pronunciation a bit opaque. Each of the instrumentalists essayed a distinct character, with Rowe and Adès atmospheric yet cool, and Eskin ardent. It’s not very often that a mainstream concert closes with contemporary music, but this one did, in the form of Adès’s Piano Quintet, op. 20 (isn’t it charming that he uses opus numbers? ), from 2000. Unlike the Mahler piano quartet, whose one movement is all the composer finished of a projected multi-movement work, the Adès quintet’s is intentionally all there is. Many one-movement works in forms that normally have multiple movements attempt to synthesize all of them into one structure—think, for example, of the Barber First Symphony. The Adès, though, reads like the Mahler—a proper sonata first movement all by its lonesome; is this a hat-tip to the Romantic adoration of the fragment? As if in answer to critics who complain that Adès is a latter-day Strauss, writing music based on visual, literary or other extra-musical ideas, this quintet is, to all public appearances, pure music, in a very traditional structure. The principal theme is striking, combining elements of diatonic and whole-tone scales in a call-and-answer figuration, with an eventual more fragmentary second subject featuring a downward-thrusting motif. As in the Sonata da Caccia, Adès’s game here is to take basic materials redolent of the grand European musical tradition and fracture them through rhythmic and harmonic offsets. The development, indeed, becomes definitely scrappier and more raucous. In a way it reminded us of Schnittke, though we won’t insist on it. After a Brahmsian “hidden recapitulation” involving reassigning bits of the theme among the instruments, the work ends on a jolly flourish. The performances, by Adès in the curiously understated piano part, Haldan Martinson (uncredited in the program booklet) and Elita Kang, violins, Mark Berger, viola, and Eskin on cello were, as far as we could tell on first hearing, exemplary. We wish, however, that Adès didn’t try to conduct his pieces from the keyboard. It is chamber music, after all, and all the gesticulating became rather distracting. Well said, Vance! I though that the harpsichord was almost inaudible in this concert-hall environment, except when the scoring deliberately left it exposed. Ades’s conducting seemed more for his own pleasure rather than to any purpose, because no one seemed to be watching it.